I didn't really know what to expect from this novel, and blew hot and cold whilst reading it, but came out very much on the pro side in the end. It was a cleverly constructed journey that makes very good use of the unreliable narrator trope to mess with the reader, the protagonist and the entire timeline of events. The book is about 17 year old Flora, who has little to no short-term memory following the removal of a brain tumour as a 10 year old child. She remembers things for an hour or so, but cannot commit things to memory. She's basically human Dory and is using a very Memento-ish technique of writing herself notes and remainders (on her arms, hands, in notebooks and post-its) to keep herself up-to-date with her own life. Every day when Flora wakes up, she is 10, her best friend is Paige and they both wore pig-tails on the first day of school. 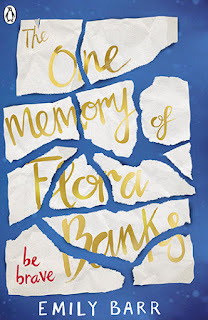 Every morning Flora has to read about her operation, her anterograde amnesia her medication and the fact that she is actually 17. Flora attends a party for Paige's boyfriend Drake (yes, Drake) who's leaving to study on Svalbard. She gets confused and leaves, making her way to the quiet of the beach. Drake follows her, and kisses her on the sand. The next day, Flora remembers. She remembers their conversation, remembers him asking her to spend the night with him, remembers their kiss and the black stone she put into her pocket as a keepsake. She has retained a memory. When Flora's parents are called away on an emergency to Paris, Flora is left home with Paige. Only Paige skips out on the gig because she's mad, so Flora's incredibly protective parents don't know that she's alone. Fixated on her new memory, she sets off to the Arctic to find him, convinced that he is the answer to unlocking her memory. Initially, this books tricks the reader into suspecting that it could be in danger of fulfilling so many damaging tropes about disability and mental health- that True Love Cures All, that taking medication changes you as a person and suppresses the True, Authentic You. But the novel cleverly subverts those ideas and makes for a much more robust character and a more fulfilling depiction of a young woman living with neurological injuries. It's not the boy she is chasing but the memory, it just takes some new context to know that. It's not *medication* that alters personalities, but there are some things that do. A very unique, compelling book with a wonderful main character, the Worst Parents, Worst BFF, Worst Boyfriend and Best Brother. It asks questions about memory and identity and how much we take it for granted, how much memory builds the people that we are and the decisions that we make. Also, interesting plot point about the gas-lighting of vulnerable people and on a related note, trying to seduce a woman that believes she is 10 and hopefully won't remember tomorrow is probably the creepiest move I have seen in YA fiction all year. Just wanted to get that in. Sophisticated, carefully crafted and brilliantly characterised. Very much recommended.